“Can city council move all in on the province’s much-expanded gambling plans for Vancouver? Last March, the province announced a new “destination casino” in one of the city’s most rapidly growing areas. In the coming weeks, citizens and their council will finally have an opportunity to table their demands for future benefits. And they had better, because so far the BC Liberal government has not offered Vancouver much in return for accepting this controversial development. It is controversial for three chief reasons. First, the city may get a far lower share of the gambling revenues than promised by the province in past agreements. While the revenue-sharing agreement has yet to be finalized, the city’s take is expected to be much lower than it would have been ten years ago. In 1999, the then-NDP government promised a 16.7 per cent share of gaming profits for those municipalities which allowed destination-style casinos. However, Solicitor General Rich Coleman recently dismissed the BC Association for Charitable Gaming claim for a 33 per cent share of the new casino’s gaming revenue, as promised in a related 1999 agreement. If the BC Liberals are renouncing an eleven-year-old profit-sharing agreement with the province’s charitable sector, why would they honour a similar deal made with civic governments? Some civic watchers believe Vancouver may see its share cut to less than 10 per cent. With $130-million in annual revenues expected for the province this means the city may be shorted by as much as $10-million a year. So you think the stadium lands are BC gov’t property & it can do whatever it likes with them? Not true! Not true. Very much not true. PavCo (short for BC Pavilion Corporation), the BC government’s crown corporation, is not free to do anything it likes. It is subject to Vancouver city processes and regulations like everyone else. It must go through the rezoning application process for the casino (which is currently much smaller and more hidden away) and it must go through the application process for gaming expansion in Vancouver city limits. Please see the Memorandum of Agreement on Gaming Policy Between: The Union of BC Municipalities (UBCM) and The Government of British Columbia (the Province). In it, the province affirms municipal jurisdiction over land use and gaming licenses, and explicitly agrees to abide by local government decisions. This massive casino expansion smack in the middle of our downtown is not a done deal, and it must not be rubber-stamped by City Councl just because the City is being bullied by the Province. If you want to learn more about why the City of Vancouver is having trouble saying no to the province, read on or look at this excellent series of investigative articles on the Edgewater expansion by the Vancouver Observer. Opponents argue that slot machines and games tables create gambling. You can hear the exasperation in Bill Chu’s voice. After years of unsuccessfully fighting city council and others in the Lower Mainland to keep casinos out of municipalities, Chu is frustrated at the lack of public outcry against a Las Vegas-style resort casino planned for downtown that could be the largest in B.C. In March, Premier Gordon Campbell announced a new 68,000 sq. foot entertainment complex attached to B.C. Place that will include two hotels, a casino with up to 150 games tables and 1,500 slot machines, restaurants, a theatre and cabaret. The proposal, however, first has to be approved by Vancouver city council, which will decide whether the property is an appropriate use for such a complex and whether gambling should be expanded in the city. Before the end of the year, council is expected to refer the proposal to a public hearing for some time in 2011. Until then,Vision Vancouver Coun. Geoff Meggs said he won’t decide whether the $450 million project should go ahead. Meggs suggested the lack of interest could be related to people not understanding the magnitude of the project. As he pointed out, a new casino would be more than double the size of the Edgewater Casino at the Plaza of Nations, which will relocate to the proposed complex. Edgewater has 65 games tables and 493 slots. “Maybe the public is fine with that, and we’ll see once it’s referred to public hearing, but it is striking how quiet it is (compared to previous casino proposals before council),” Meggs added. Las Vegas-based Paragon Gaming Inc. owns Edgewater, having bought it from local owners Len Libin and Gary Jackson in September 2006 for $43 million. The deal made Paragon the first foreign owner of a casino in B.C. The company specializes in Native American and First Nations gaming in the United States and Canada. 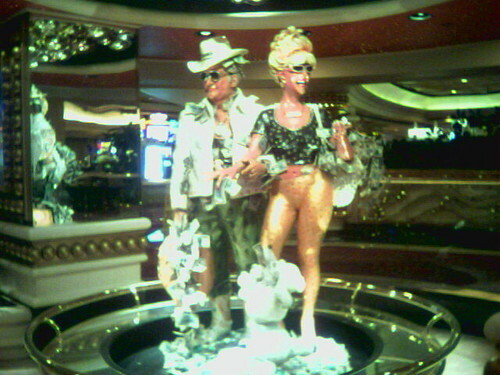 Paragon formerly operated the Sahara Hotel and Casino in Las Vegas. Hastings Racecourse, which is operated by Great Canadian Casino, is home to the only other casino in the city and has 600 slots. More than five years ago, previous councils approved slot machines at both casinos, despite pushback from community groups and a minority of councillors. Until those approvals, the city councils of the day boasted about not allowing slot machines in the city. The biggest rejection occurred in 1994 when the NDP government floated a mega casino to be built on the Vancouver waterfront by Las Vegas gambling magnate Steve Wynn. But Chu believes the current council, which includes politicians who voted for slot machines, will approve the mega casino proposal. The fact that profits from developing the land slated for the complex will be used to pay for the $458-million retractable roof being built on B.C. Place is more evidence the proposal is a done deal, Chu said. Chu has argued that slot machines and adding games tables would create gambling addicts and attract criminals such as gangsters and loan sharks, which has occurred in Richmond. The Vancouver Police Department announced Nov. 8 that three men were arrested in connection with a robbery of a Vancouver customer of the River Rock Casino in Richmond. The VPD also investigated a similar robbery in 2006 when a customer of the Edgewater Casino was followed home and hit over the head with a pipe and slashed across his abdomen and back. In July 2009, the city released a report that said the addition of 600 slot machines at Hastings Racecourse was not harming the surrounding community as was anticipated by residents. The staff report said traffic, problem gamblers, prostitution or crime has not increased in the area. The report, however, pointed out that 150 slots began operating at the racecourse only in November 2007. An additional 450 slots weren’t added until August 2008. “While it may be early to do a full analysis of impacts, indications are that the addition of slots has not materialized in some of the negative impacts raised as concerns during the rezoning process,” wrote Mario Lee, a city senior social planner. According to a city report released in June 2008, the total contribution to the “Edgewater Casino Social Responsibility Reserve” was $700,000 and expected to grow at a rate of $200,000 a year until July 2013, totaling $1.7 million. To the average member of the public, gangs are associated with violence and turf wars. This view masks the reality that organized crime is fundamentally a large scale and powerful business, with operations throughout society. If you think organized crime will not touch you or your family through the expansion of gambling, think again. Last year Betty Yan, a mother with children at a prestigious west side school, was shot to death in a Richmond parking lot. She was a loan shark working with gangs. Her clientele were gambling addicts in Lower Mainland casinos. The damage didn’t end with her death. Parents at the west side elementary school, afraid for the safety of their own children, forced the woman’s young and traumatized children out of the school. And Yan was not the only murder victim tied to gambling and organized crime. In 2006, loan shark Lilly Li left her regular shift at Richmond’s River Rock Casino with somewhere between $20,000 and $300,000 in cash, and disappeared. Her body was found months later, buried in a shallow grave at Jericho Beach. This is happening in our city–our Metro Vancouver–and it is part and parcel of the expansion of legalized gambling and the building of casinos in our midst. And just who do you think is there to help them with that little money-making sideline? Why, the gangs, of course. All under one roof, care of the BC taxpayer. BC gambling in the old days mainly involved provincial lotteries and smoky bingo halls operated by charities. Those days are long gone, and the glittering gambling palaces that replaced the bingo halls are the perfect venue for budding young Scarfaces with their loan shark, money laundering, and drug dealing activities operated by the Hell’s Angels, the Asian triads, the UN gang, and Indo-Canadian gangs. Policing legalized gambling operations requires highly specialized resources, training, sophisticated data bases and communications, and a far-reaching law enforcement strategy. Naturally, you would expect that our provincial government, concerned as it is about the protection of the public and the perception that legal gambling operations are squeaky clean, would aggressively target the criminal element. Yup, and there is a great bridge for sale in Brooklyn, too. The fact is that Minister Rich Coleman, who takes the gaming portfolio with him to whichever ministry he is moved to, has completely abdicated his responsibility to ensure the public is adequately protected in BC casinos. Faced with a report in January 2010 from IIGET that casinos are a hotbed of illegal activity (RCMP Money Laundering Report), and the team does not have nearly enough resources to do even rudimentary investigation, Minister Coleman immediately took decisive action: he disbanded them. Now there is no serious oversight of gang and organized crime activity in casino operations. Now, as a result of the most recent cabinet shuffle, BC’s minister responsible for gaming is ALSO the Solicitor-General, and responsible for policing. Even for gangsters, BC is Open for Business! Dear Vancouver, do you really want a mega-casino in your downtown core? The current Edgewater Casino is quietly slated for a location move and then a massive expansion in our downtown core, right near the BC Place Stadium. This could happen within a matter of weeks. It will put the casino adjacent to all of the high-end dense living of False Creek and Yaletown, not to mention adjacent to the Downtown Eastside, already plagued by crime and addictions. Massive casinos, which are generally not found in the downtown cores of other North American cities, other than Vegas, attract endless undesirable social problems: crime, loan sharks, addiction. They are not socially palatable. Nor will this mega-casino complex be architecturally palatable – it will be designed and built by Vegas. It’s not even going out to architectural competition – its design has already been proposed and it’s hideous. 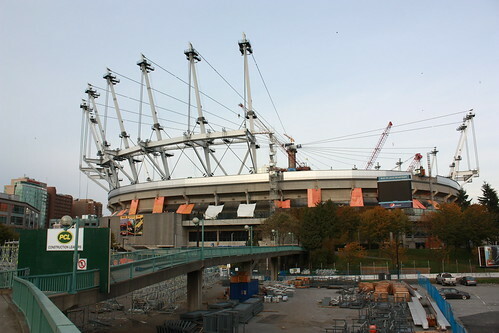 We have already had an ugly, expensive and impractical stadium roof foisted upon us by the BC Liberals government; now we will be subjected to this massive gambling expansion unless we speak up. The province has bullied Vancouver enough. City Hall, start standing up to the bullies! What cards are they holding that you fold so easily? Write to the mayor and city council! Tell them how you feel about this scheme which is very quickly and very quietly being pushed through City Hall by the BC provincial government. Also note: gambling expansion has been pushed throughout BC with the excuse that it pays for our crucial non-profit and charity sectors. Despite laws legislating this, it has never been done. Money from the casinos is being used to fill in the gap left by the government’s own economic policies. Don’t let them gamble Vancouver’s liveability away.